The Aviation and Transportation SUPERDUTY HEPA BackPack with a 400hz motor uses the same power source found on aircraft, trains, buses, and more. No need for bulky adapters. Just plug-in and speed clean. Choose from our 10-quart or 6-quart models depending on the available work space and capacities needed. The Construction SUPERDUTY HEPA BackPack has powerful performance for demanding situations. Using a Torque Master two-stage motor speeds the recovery of heavier particulates. Perfect for use in construction, demolition, restoration, remodeling and as an attachment to high speed floor buffers and sanders. 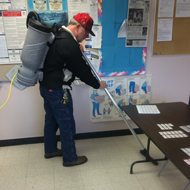 Vacuum 60% faster with the Super Tomcat SUPERDUTY HEPA BackPack. Extremely high air-flow speeds your cleaning, increasing productivity, reducing costs and effort. Great for use in schools, office buildings, hospitals and high traffic areas. 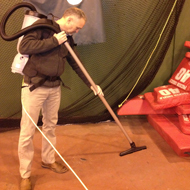 Highly effective in removing fine dust and particulates embedded deep in the carpet fibers. The SuperDuty BackPack Vacuum can come in a 6 Qt or 10 Qt size all with HEPA Certified Filters, 7-Year Ametek Motor Warranty, and Lifetime Housing Warranty. Tomcat is proud to announce our HEPA Back-Pack vacuum line of products has received the CRI "Carpet and Rug Institute" GOLD SOA/GL Certification / Green Label. Certification number "83648 Gold". 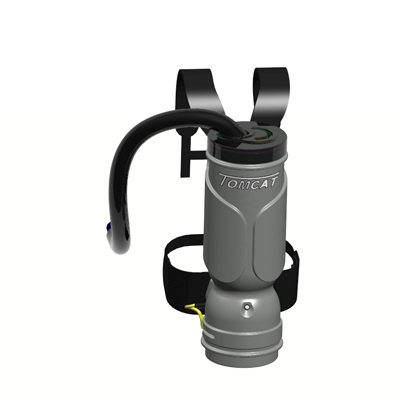 This is the highest level of certification for our industry and a resounding approval of the excellent product that Tomcat designs and builds in the USA. 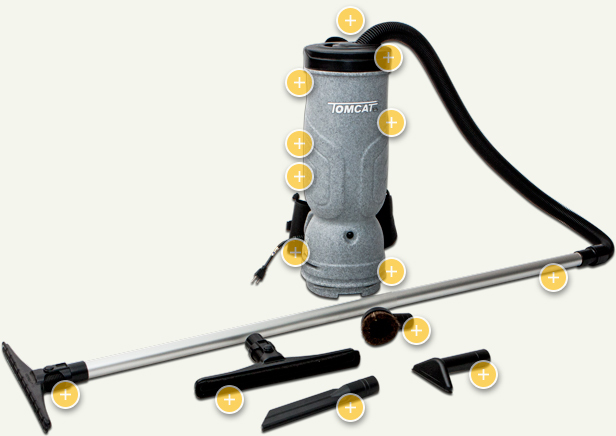 These images demonstrate how easy the Tomcat SuperDuty BackPack Vacuums really are. 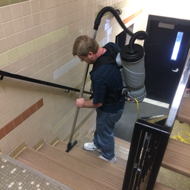 From being used in Gym Field Houses, Tight Stairwells, and School Classrooms, these vacuums are tough and can handle anything you can throw at it.